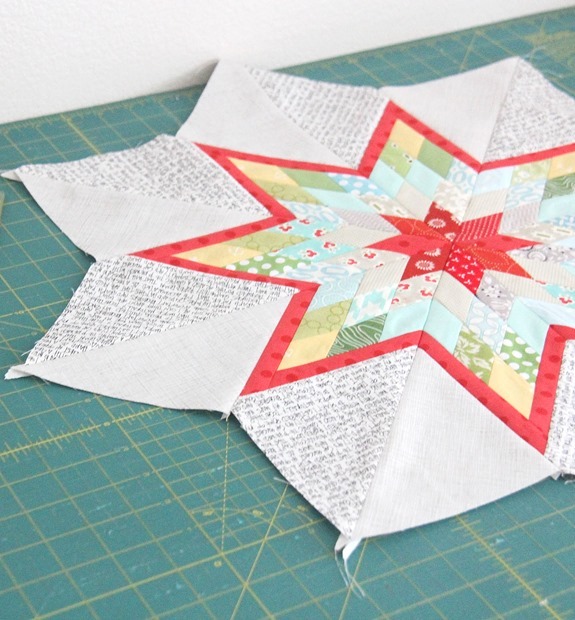 I’ve had a Lone Star quilt on my mental to-do list since I started quilting…and seeing a block Elizabeth posted last week in Instagram gave me a push to do it. I thought this would be a bomb (not the bomb…aaaa bomb)…but it actually went together pretty easy. The diamond strips are 1.5″ cut and the red border strips are 1″ cut. I realized while making this, that my seams matched up better when I didn’t pin at every seam. It might have something to do with the angled seams, being able to ease the fabric in as I go, or being able to feel where the seams intersect as I sew. Or maybe it’s all in my head and I just hate to pin. After I tucked my kids in bed I spent over an hour trying to figure out the math to make this block…and after I’d wasted an hour of my “Mom” time…I did a search online and found some great tutorials! I used this tutorial for making the center portion….I made mine a bit scrappier. I used this tutorial for adding the borders and finishing the block. She also has a handy chart to figure out different sizes and how bit to make your background blocks. I love the colours! I tried a mini lone star years ago, and the centre does not lie flat. How did you ensure it lies flat? Well it more than justifies the effort; it's stunning! I'd be tempted to try to make one myself but I'm a little daunted by all the itty bitty pieces. But I think that might explain the pinning thing – perhaps if the pieces are that small even the finest pins distort them out of line. I think that the Lone star will be making its way to my To Do List. this is awesome!! love the color combo! That is a really lovely star. I love the colours used and the text print. Love it! Thankyou for the link with the tutorial. Beautiful! I have too have had the lone star on my to do list for a while. I even have the strips cut out! Perhaps on day soon I will actually finish mine. Looks amazing. I might be a rebel, but I never pin. I just hold things in place as I go. Love this. The colors are stunning. ohh lovely! Great colours. I'm with you and pin as little as possible! Love your Lone Star! Looks fabulous! Gorgeous! This has been on my to do list for years, but I keep chickening out. This is gorgeous! One day I may attempt one! Stunning! Love the pop of red. Gorgeous! And thanks for the links, this one's on my to make list… someday! Oh my goodness, so many little pieces of fabric and it all has come together beautifully! Gorgeous! This is one of the prettiest lone stars I've ever seen! I love the way you mixed your cheery brights with the gray texture and B/W text background fabrics. Very nicely done! Your lone star looks beautiful!!! Thanks for the links! Ficou lindo, adorei as cores! well done – another one I might need to try! First off…WOW! I love the block, the colors and the text fabric. It is beautiful! Gorgeous! I too have wanted to make one of these forever! yours is so pretty. You may have inspired me to jump in!! Your precision is amazing!!! Great job. 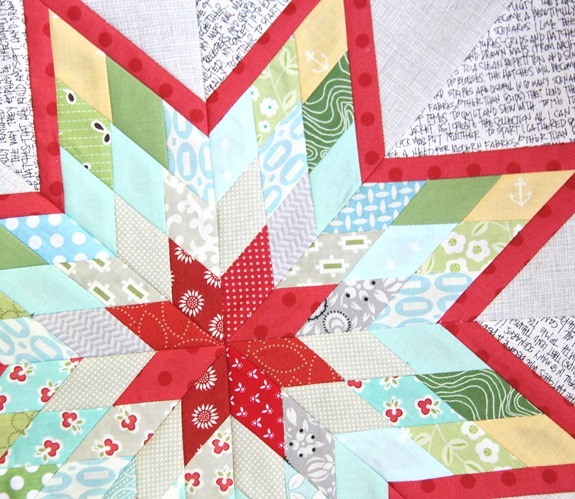 Ideas on the quilting? I am a longarm guilter and I have a customer who finished her Grandmother's quilt and has very large empty blocks on the corners. Love your quilt. Perfect! My first thought was "stunning, absolutely stunning" but as several others used the same adjective, tried to think of some other description. Words just don't do it justice! This is just so fun, so fresh! Allison, you have such a gift! Thank you for inspiring your family and the rest of us to think outside the box, to dream and to go for it! I'm impressed. It's so pretty. Gorgeous! Love the color combo and the word fabric together. Is that an Essex linen I see next to the words? 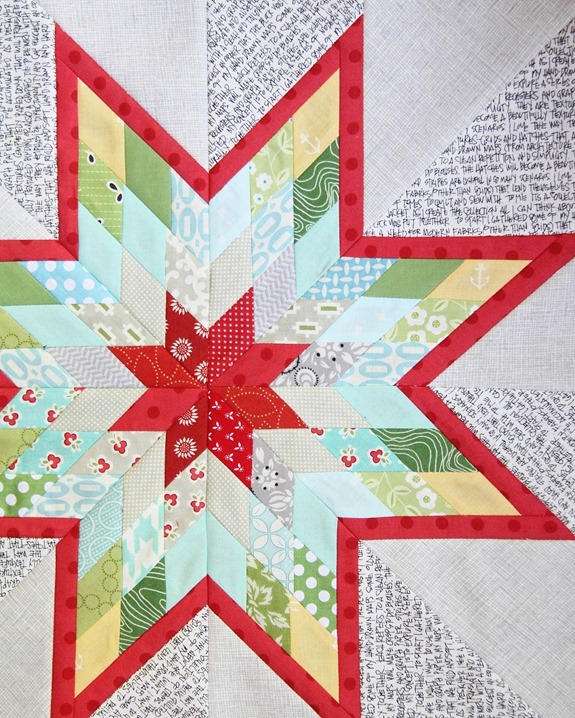 I love a lone star quilt and this is absolutely beautiful. Nice Job! Love it! I love the controlled scrappiness. WOW I've been inspired… now I want to make one. This is just beautiful!!! What great tutorials. Love your star block. So pretty.